The Atomium is located next to Mini-Europe park (which has miniatures of the famous monuments of EU at a scale of 1:25) beside the King Baudouin Stadium. It is a structure which represents a unit cell of an iron crystal. True to its representation, it has nine spheres made of steel (earlier it was made of aluminum) connected by tubes along the twelve edges of the cube. The structure is 334.6 ft. high with the spheres having diameter of 59 ft. Its stability is ensured by three bipods. The details of the spheres and the locations of the various attractions within the spheres are given in the image here. Please click on the image to enlarge. 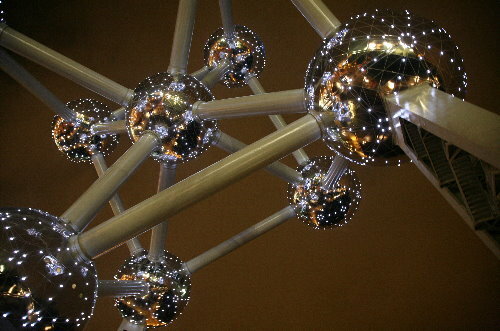 The Atomium was built for Expo’1958 – the 1958 Brussels World fair in Belgium. It was designed by Andre Waterkeyn. (the central sphere has been named after him after his demise). The architects were Andre and Jean Polak. It was meant to last just for the Expo (from 17th April to 19th October 1958) but its popularity resulted in it being made permanent. The structure is quite impressive. It is all the more impressive since the skyline is not spoiled by other tall structures. Inside, the tubes which connect the spheres contain escalators, exhibit halls et al. The top sphere affords an excellent panoramic view of the city including an aerial view of the stadium. Three of the upper spheres are closed to public for safety reasons – since they lack the requisite vertical support. The sphere at the pinnacle is open to the public. The top and central spheres are accessible only by lift. The others spheres can be accessed by the steep escalators and these cannot be accessed by people on wheelchairs. The base sphere (called Henri Storck sphere) has permanent exhibition dedicated to the fifties. The central sphere has a bar. The kids sphere is meant for sleep overs for children from school. This is not open to the public. 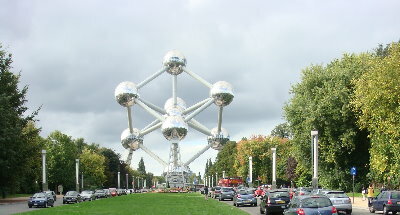 The Atomium was closed for nearly two years between 2004 and 2006 for renovation. This was when the aluminium sheets were replaced with steel ones. The interiors were also redone. By metro (subway) – Get down at the Haysel/Heizal metro station on line 1A. This can taken from Station Brussels Central. 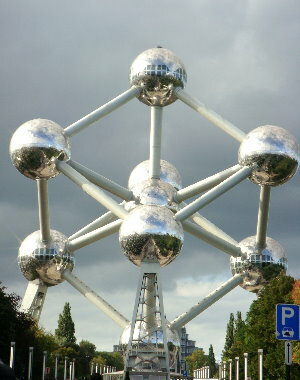 By Coach – Take the Brussels Ring Road, then to exit 8 and then follow the direction to Atomium. It’s well marked. Information about getting around in Brussels can be obtained from the following Link. Opening Hours – Open daily from 10 A.M to 6 P.M. The 50th anniversary celebrations of Expo 58 took place between April – October 2008. Ticket Price – Ranges from Free (for Children less than 12 years, Bus drivers & Disabled persons) to € 9 for Adults. Seniors (over 65 years) – € 6. The rates differ for groups. Minimum persons required to qualify as a group is 20. Pavilion of Happiness rate is € 5 for everyone. 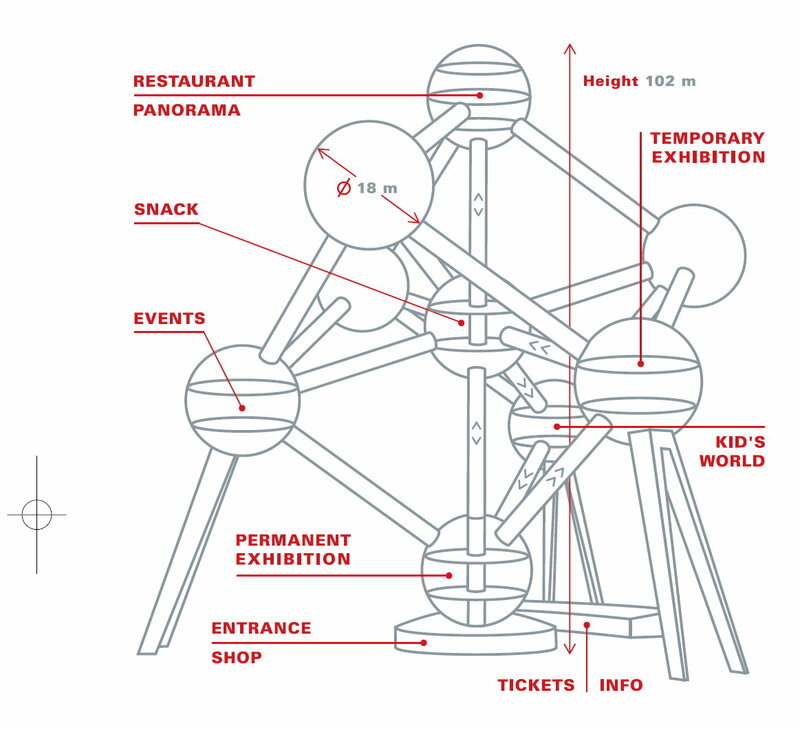 Combo tickets are also available for Pavilion of Temporary Happiness and Atomium. For the 50th year commemoration of Expo’58, a number of activities based on the Theme “Brussels Happiness” is taking place. 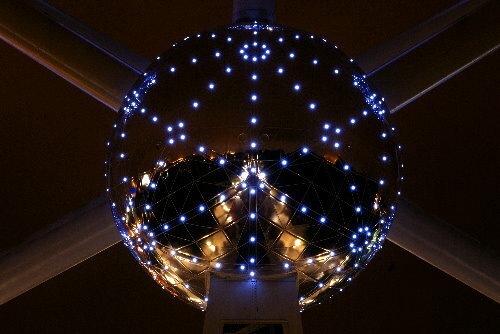 The Atomium by night is a beautiful sight.